A Sagittarius Ascendant endows you with the type of flexible personality that works well for you. Because of your need for independence and freedom, you tend to find yourself in changing circumstances and different environments. Such changes of course require a certain amount of adaptability. With a Sagittarian ascendant, you are inclined to put marriage off until later in life (or skip it altogether) unless you find an understanding partner who does not attempt to be possessive or confine you. Once such an acceptable marriage arrangement is made however, the Archer adapts and makes a stable, loyal spouse. You are full of energetic enthusiasm, but this enthusiasm is not always accompanied by unflagging physical energy. You tend, in fact, to be lazy unless highly motivated to perform. It is often difficult to engage in boring routine exercise and, despite an innate restlessness and propensity for rushing around in a myriad of activities, you are quite capable of being unwilling (or unable) to keep yourself in good physical shape. Nevertheless, though often rash and hasty, your passions are sincere and inspirational. Sagittarius is ruled by Jupiter, planet of inspiration, wisdom, good fortune, and abundance. You are inclined to be spiritually or philosophically oriented, talkative, intellectually curious and, at times, perhaps a bit too impressed with status and wealth. Although usually surrounded by a sense of limitless abundance, your natural exuberance and generosity can also generate the urge to throw your money around. Like those with your opposite sign Gemini rising, you can demonstrate a wide range of orientations and abilities: from being a great teacher, writer, scholar or researcher, all the way down to the flimflam of con artistry and the intellectual emptiness of copying the originality and talent of others. You are usually very honest, though it is also true that your too-candid remarks can sometimes be misinterpreted as rudeness. Negative influences associated with Sagittarius rising stimulate a tendency for self-indulgence, which makes you pompous, grossly overweight, dependent on drugs or alcohol, or too opinionated and cynical. 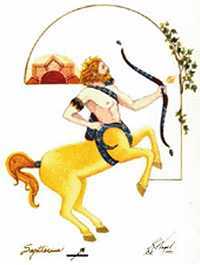 On the positive side, Sagittarius gives a love of drama and the theatre, good food and drink, dancing, sports, animals, and, as a rule, you'll never miss an opportunity to travel. You are likely to be involved with publishing, education, religion, art, or music, either as a profession or hobby.